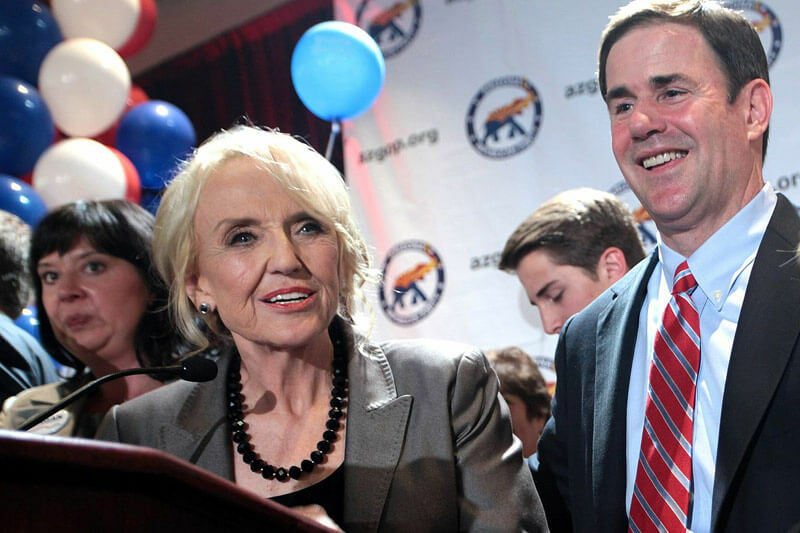 Twelve years of pent-up gubernatorial aspiration means a crowded field in the race to succeed Jan Brewer. Brewer announced on Wednesday she will not seek reelection. LOS ANGELES — This November something will happen that hasn’t in 12 years: Arizona will have an open governor’s election, and more than 10 people say they want the job. The lineup of declared candidates includes everyone from the former CEO of Coldstone Creamery, a former Go Daddy executive, and a mayor. “Anybody in the political class who wants to be governor is running,” Doug Ducey, the former Cold Stone Creamery CEO and current state treasurer who announced his candidacy in February, told BuzzFeed. The last open election was held in 2002 and won by Janet Napalitano. When she was tapped to head the Department of Homeland Security in 2008, Arizona’s line of succession called for its secretary of state, Jan Brewer, to become the new governor. Brewer, who confirmed Wednesday she would not seek reelection, was elected to a full term in 2010 on a campaign that emphasized the state’s strict laws on undocumented immigrants. She currently holds a 42% approval rating in the state. Entering the void is a slate of Republicans of varying backgrounds and just one Democrat, Fred DuVal. Those familiar with the race offered various explanations for the disparity between the number of Republicans and Democrats, generally citing two: the lack of a deep Democratic bench and the national divisions within the Republican Party playing out in the state. The Republican candidates range across the conservative spectrum — and are spending a lot of time trying to distinguish themselves. Ducey, the state treasurer, has positioned himself as a CEO with real-world experience. The campaign for Mesa Mayor Scott Smith characterizes him as a turnaround artist who can manage budget deficits. Former GoDaddy executive Christine Jones is gunning for a different kind of voter: She’s voiced support for the polarizing Maricopa County Sheriff Joe Arpiao. Her spokesman emphasizes the second amendment events she likes to attend. Meanwhile, Arizona Secretary of State Ken Bennett’s spokesman described the candidate as a “mainstream” and “pragmatic” Republican. A Public Policy Polling poll released March 4 showed Bennett leading the race with 20% support. Rodolfo Espino, an assistant professor at Arizona State University, said he saw Bennett as the likely Republican to emerge. But the race will ultimately come down to resources, Espino said — an area where Bennett’s falling short, according to the latest campaign finance filings. Bennett has raised just $17,492, according to the most recent filings. Conversely, Ducey has amassed more than a million dollars for the primary alone, and spent less than $200,000. Jones reported more than $500,000 in funding (including a nearly half-million loan from herself to her campaign) — she also spent more than $500,000. The disparity between campaign cash and early polling numbers signals a wide-open race, said Brian Seitchik, Jones’ campaign manager. “This race has a long way to go and it’s very early,” he said. Seitchick pointed to Jones’ social media presence — she has more likes than the other candidates — and how she’s polling better than “more established politicians” as proof his candidate is a serious contender. “She’s not a politician and I think that’s resonating with folks.” Those familiar with the race also mentioned Jones’ personal wealth as an asset to her campaign. Although Arizona tends to lean right — the GOP has a majority in both houses of the state legislature and Romney won the state with 53% of the vote in 2012 — its gubernatorial races have been historically close; Napalitano won in 2002 by less than 1%. “There really is this history in Arizona of looking at these governors races in a very non-partisan way,” said Scheel, the spokesman for DuVal. Changing demographics could make races even closer. According to U.S. Census data, Arizonans identifying as Hispanic or Latino have increased from 25.3% in 2000 to 30% in 2012. “If you look back within the past 12 years, I don’t think there was any discussion about [Latino voters] being in play, said Gabriel Sanchez, a spokesman for Latino Decisions, a political opinion research group. And Latino voters tend to be younger. The median age of Latino voters in Arizona is 25, versus 45 for white voters, he said. But Republicans don’t seem worried. Sifert said voters would be energized by their opposition to Obamacare, and argued the large number of Republicans running against each other was an asset, because voters would be more familiar with them. Reprinted from BuzzFeed. Article by Hunter Schwarz, BuzzFeed Staff. Read the original story here.